Here’s the only before pic I could find. This was taken before Christmas and I had cleaned off David’s night stand full of books. There are Christmas presents in there too. Here are a couple of whole area shots. My dream desk is to have some kitchen/bath cabinets and a countertop. That way everything can be stored behind doors/drawers and there is a really clean look. This desk makes things look cluttered even when it isn’t. However, the desk will have to wait a little longer, so I used what I have and make things work. I’ll try to go around the area and tell you what I have. 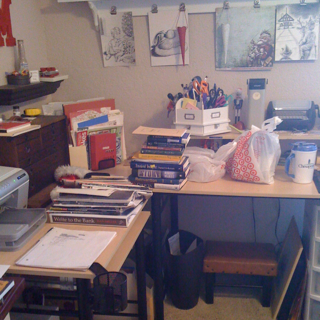 (BTW David and I share an office so this is my half). The white drawer units/cubes I got a few months ago at Michael’s (for the drawers) and Hobby Lobby (cubes). HL didn’t have the drawers but M’s did. I used coupons for them so in 2 months I was able to get all 4 units. The drawers are sitting on an old microwave stand that our friends didn’t want anymore. We’ve had it for a while and it’s served many purposes in our home. It has cabinet doors on the bottom but I took them off hoping to store Trey’s stuff down there but that didn’t work out. I needed the space more than he did! I store my memorabilia box, paints, jewelry box, knitting bag and old photos in the bottom and I have 2 boxes with camera stuff and a box with cards in the cubby. Right now the drawers hold scrapbooking supplies. Next to the drawer tower is my “inbox”. Years ago I found 2 old wooden drawers (pulled out of a nice desk) at an antique store. I fell in love with them and my MIL got them for me. I finally decided that I needed to paint the one I have in the office. So, using left over paint I spruced it up and I really like how it turned out. I just need to label it. Next is my new sewing station. I wanted to be able to keep the sewing machine out so that it was much easier to use. I used to keep my printer and my laptop in this area, until the laptop died and now I share the desktop with David (he’s so sweet!). Thankfully the printer is wireless and so I was able to move it, freeing up some space. This part of the desk also had a keyboard pullout but I couldn’t get my new chair close enough to push the pedal for the machine so David removed it for me. Right now I keep all my thread in a little plastic box with cubbies and most used tools in a pencil holder. Everything else like misc sewing tools or sewing machine extras, needles and fabric paint are in their own box. This will probably change soon but this works for now. My fabric is stored in a big tub under my desk. I also have started a notebook for sewing ideas, knitting ideas and anything else. It sits in this area. Next is one of my favorite things. This wooden cabinet was my great-uncle’s. My dad had it for as long as I remember in his shop. He’s a carpenter on the side and this last summer he redid his shop and the cabinet wasn’t going to work for him anymore and asked me if I wanted it for my scrapbook stuff. I didn’t know where or how I’d use it but I thought it was great and so I got it. It has all these great drawers and then a pull out front door thingy that locks so if you need to move it the drawers don’t fall out. The door was damaged beyond repair so my dad made a new one with the original lock and then I stained it to match the box. I store inks, colored pencils, chalks, pens, markers, glitter, adhesives and then chap stick, Kleenex, hand lotion and a nail file in this thing. Next is my lazy susan thing. It’s by Making Memories and I love it! I like having all my tools easily accessible. Next to that is my work space on the bottom with my cutting mat and my light, Epic 6 and Circuit on top. Under my desk is a 4 drawer rolling unit (this desk doesn’t have storage). It houses my embellishments, stamps & supplies, lettering (chipboard, etc) and tools on bottom. Next is my cubes, the top one holds all my paper and paper I’ve set aside for Trey when he’s ready to use it. The bottom one holds idea books, printer paper, canvas panels and my knitting books. And I was able to get the printer on top of the cubes. Between the cubes and the drawer unit/desk I’m keeping my Project Life album and my tote that holds layouts waiting for an album. Here’s a shot of my wall. On the left is my magnetic board that my dad and I built. I got all my supplies from Lowes, it’s just sheet metal that I think my dad cut, some molding that he cut and made a frame with and I painted. Above this is a sign that says “Simple”. David got it for me for Christmas a couple of years ago. This is one of my mottos so he knew I’d love it! I have a small little shelf from HL that I painted and currently is just for pretties. Then comes my big shelf. I saw a version of this several years ago and promptly set out to make it. I was looking for a way to show off my layouts before stuffing them in an album as well as storage. So we custom made this for my needs. If you want to know how we made this email or comment and I’ll break it down. It holds 10 glass jars from HL, which holds ribbon. I love the rainbow color! And I also have an antique camera and an “M”. I think that about covers it! Sorry this was so long, I wanted to cover everything and I know that I really like seeing other people’s creative spaces. I’d love to hear about your spaces. If you can share pics or just tell me about what works for you.